Having recently blogged about tomatoes and mozzarella, I fancy a lunch today that uses this delightful Italian cheese. 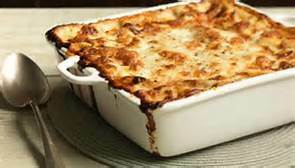 This dish is a classy lasagne with a difference and is ideal for impressing your friends - lusciously rich and tasty. Have a go, you'll love it! Heat the oil and butter in a saucepan, add the onions and fry for 3 minutes. Add the mushrooms, turn up the heat and cook for 5 minutes. Add the cream, white wine, thyme, salt and pepper and simmer for 4 minutes. Put 4 sheets of lasagne in a large oven-proof dish. 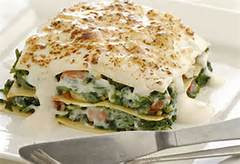 Spoon on a generous spoonful of the mushroom mixture onto each piece of lasagne, add some red pepper slices and half of the spinach leaves and put another piece of lasagne on top. Add the rest of the spinach leaves, a slice of mozzarella and top with a little more mushroom mixture. Finish with some Parmesan shavings. Place the lasagne under a hot grill and cook for 5 minutes until the mushroom mixture is bubbling and the Parmesan is golden. Cut and serve while hot with crusty bread.